Over the years decks have become popular for Canadian homeowners looking to add some extra outdoor living space. A deck can add curb appeal and value to any property. It's one of the best home improvements you can make outside the home. Deck maintenance is essential to the life of a deck. Nowhere is this more important than in Canada where the winters can be harsh. No doubt Canadians love using their decks during the warm season but winters can take their toll on exterior wood. When a wood deck is not protected with a deck stain, water can seep into the wood. Freeze/thaw damage is very common on Canadian decks that are not protected with a quality deck stain. The best Canadian deck sta, ns are the ones that penetrate deeply into the wood for maximum protection against rain, snow, and ice. But not all deck stains are compliant in Canada so finding the right one can be tricky. There are however, a few deck stains that are compliant and have excellent penetration properties. These deck stains will not only enhance the beauty of your deck but will prolong the wood's life even in harsh winter conditions. Two popular brands of deck stains compliant in Canada are Defy Stains and Armstrong Clark Wood Stain. Both are high on our list of best stains and are VOC compliant in most states and Canada. They come in a wide range of opacities and colors to fit the needs of most deck owners. For the best results, a wood deck should be cleaned and stained every couple of years or as needed. This will ensure protection against weather damage. Clean the wood with a quality wood cleaner. After cleaning the wood will appear darker, this is normal. Use a deck brightener to lighten and restore the wood's original color. Once the wood dries coat the surface with a quality Canadian deck stain. Keeping a deck protected with a good wood stain is a great way to protect your investment. Do not let harsh winter conditions ruin your deck prematurely and cost you expensive repairs. Protect all your exterior wood surfaces with one of the best Canadian deck stains to ensure lasting beauty for many years. If you have any questions as to which stain is best for your deck in Canada, please ask below. This is over treated pine after weathering for a year and being cleaned with a deck cleaner. Armstrong Clark semi transparent stain in Natural Cedar color. Location is Alberta Canada. 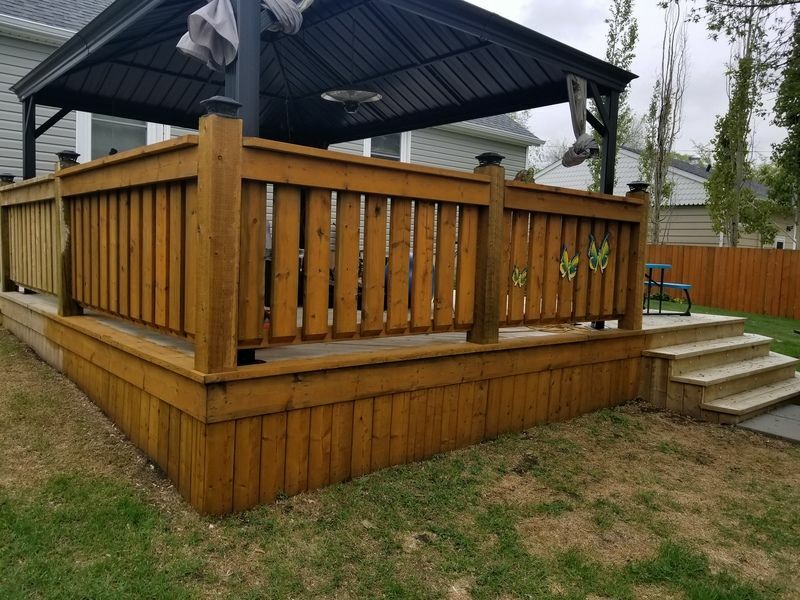 In October 2016 we built a new cedar deck in Edmonton Alberta. In June 2017 we cleaned the deck with Restore-A-Deck cleaner and then brightened with Restore-A-Deck Brightener. We then stained the deck with Armstrong Clark. All steps were carried out as per manufacturer's instructions. Although initially the results of the AC looked great, over the course of the summer the deck mildewed extremely - by September of 2017 the deck was quite black. It appears that the AC is not well suited to our northern Alberta climate. I am planning on stripping the deck this spring with Restore-a-Deck Stripper, brightening with RAD and trying Defy Extreme. Given that the AC is oil-based and the Defy is water-based, will I have a problem with the Defy properly penetrating the deck? Also, have you heard of this type of stain failure with the AC before? If you strip, you are good to use any brand or type of stain that you like. No issues with penetration. No on the AC. It is most likley not related to just the AC but yur environment itself. Both are quality products for Canada and would work well. The AC will penetrate a little better so less chance of ever having to sand. Just clean and reapply. Where can I buy Defy extreme wood stain in the Sault Ste Marie, Ontario area or in the state of Michigan? There are not dealers in Canada. We are located in Bloomfield Hils, MI. We can ship this to you as well. We have a deck that is a year old, made of pressure treated pine and has not been treated with anything yet. What would you recommend we use to seal? We would like it to be as simple as possible. Thanks. Prep to remove the Thompsons with a stain stripper and pressure wash. If needed, sand any stubborn areas after the stripping. Use a wood brightener after to neutralize. Stain with Armstrong Clark or TWP 200 Series. Live near Toronto going to be in Buffalo this weekend where can I but your stain for my deck. Sick of staining it every year. We only ship from our website. We can ship to Buffalo if you would like to pick it up there. Defy only comes in a semi-transparent. What would you recomand to use for a brand new )uninstall yet) pergola made of Red Western Cedar. I like to preserve the beauty of the wood grain. It is for the wood siding of my cottage. It is a mid dark honey Color that needs cleaning then brightening up. Possibly a clear stain ? Also I am building a small extension, siding about 500 sq. ft., and would try and get a close Color match to the rest of the cottage. The original stain is about 20 years old and was very much a oil product. I live in Grafton, Ontario . I have been reading aboutTWP 200 series and Armstong Clark , those seem to have maintained the oil level in their products but you may have other suggestions. Either the TWP 200 or the AC would work. You do have to remove the previous coating to use these though. Only online from our sites.